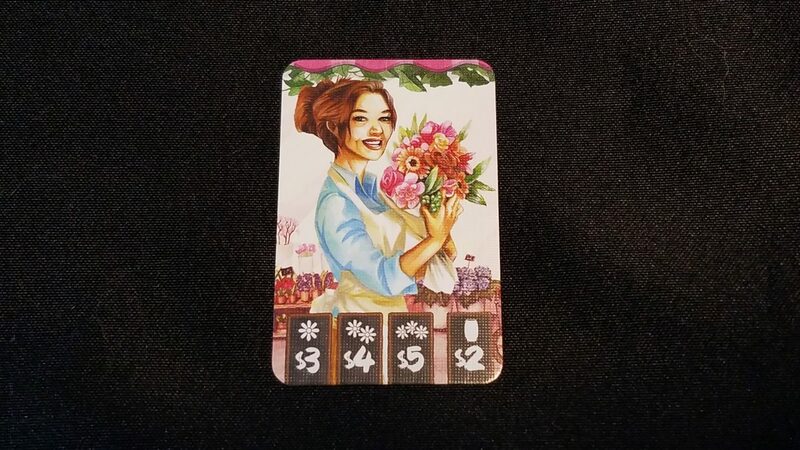 The Little Flower Shop is a charming game, with a gorgeous aesthetic and easy to engage mechanics which reveal just a bit more strategic gameplay than you might expect - and that's a great thing! 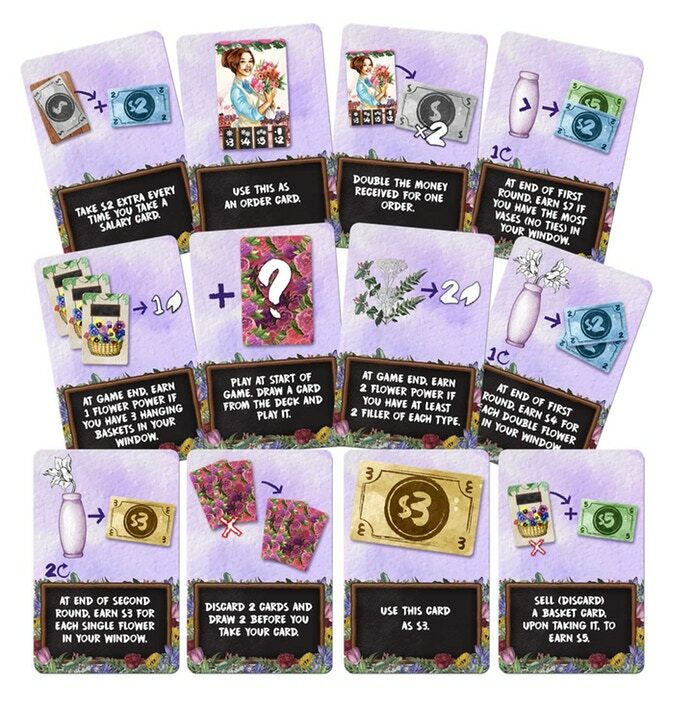 The Little Flower Shop, from Dr. Finn’s Games has a lot going for it – from the serene theme, to the approachable, fun gameplay, to the lovely art, this drafting game of set collecting and floral arrangement sits lovely upon the table, inviting newcomers and seasoned gamers alike to partake in its floral pleasantness. 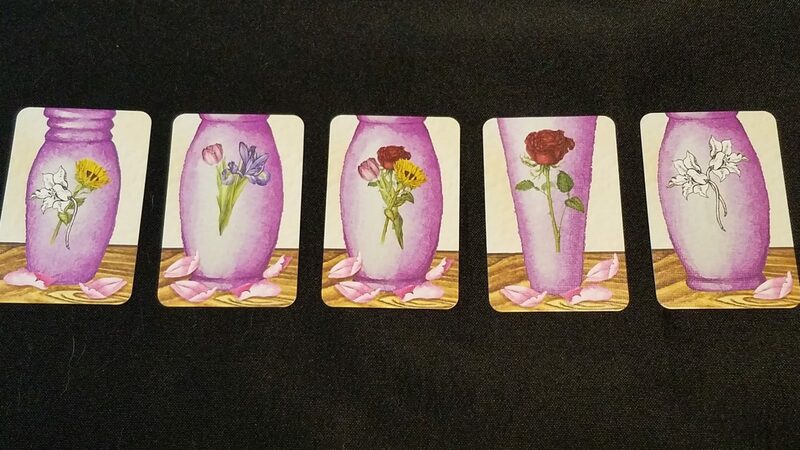 Most definitely an approachable, family or gateway level game, The Little Flower Shop nonetheless has some strategic elements. 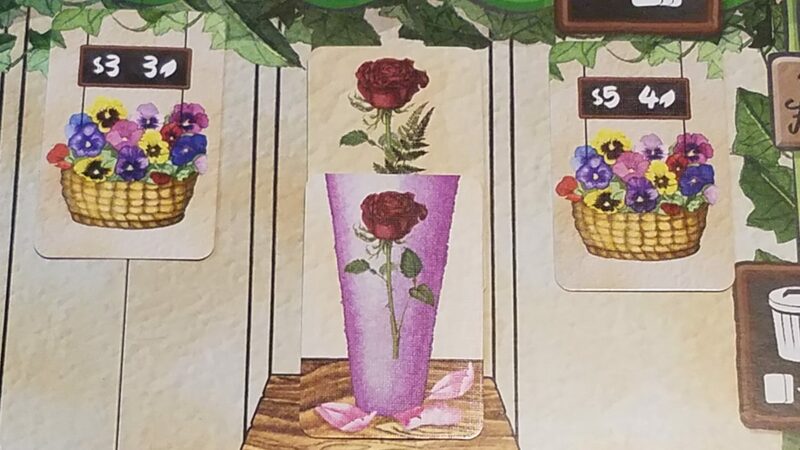 The basics of the game are these: each player is arranging the front window of their florist shop, and the player who can most artfully combine their flowers and vases into a pleasing configuration will earn the most points and be declared the best flower shop in town! Players will draft cards one at a time, passing their hands around the table between each draw. 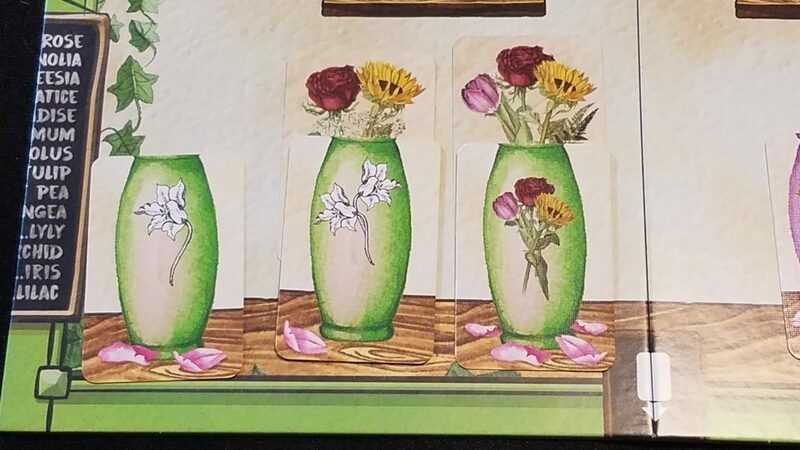 As they draft, they will seek to get combinations of flower/vase cards, gather the money needed to beautify their shops with baskets, and fulfill orders as they are able. After 3 rounds of drafting, final scoring will determine which shop has the most ‘Flower Points’ and is therefor the winner! The Little Flower Shop is, simply put, a delightful game. It’s aesthetic is pastoral and pretty, and a far cry from the typical fantasy/sci-fi/medieval farming fare that adorns a huge body of games these days. But more than just a visual treat, The Little Flower Shop plays really well. Set collection is satisfying, and while the deck does subject its players to a degree of randomness, there is a smoothness to the game that makes it a fantastic game to introduce players to the concept of drafting and set collection games. The Little Flower Shop plays 1-4, featuring a built in solo mode and optional rules to change the experience at lower player counts. So far, we’ve enjoyed it with 2, 3, and 4 (we simply haven’t tried the solo option yet). It’s a game that hits nearly any table with ease – acting as a palette cleanser between heavier fare, or standing on its own as a pleasant, easy-to-engage good time. While assuredly landing on the lighter side, as is so often the case with Steve Finn’s excellent catalog of offerings, The Little Flower Shop delivers fun without complication, and we think that’s great! 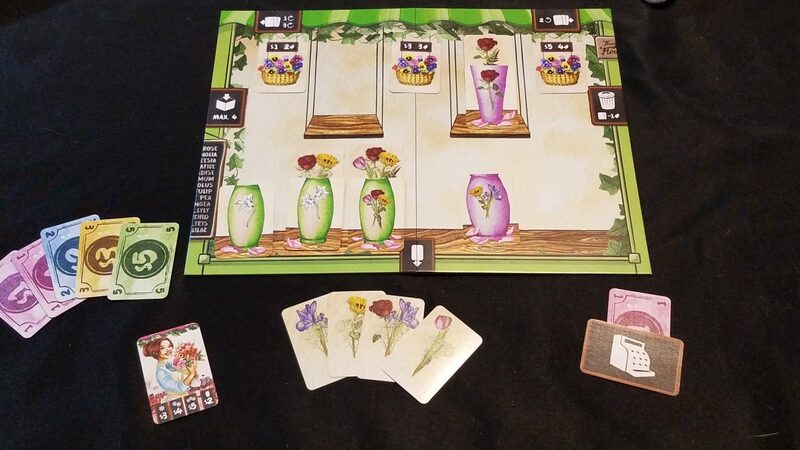 The Little Flower Shop Potpourri Pack is up on Kickstarter right now! This small expansion adds a whole lot of variety to the breezy base game. 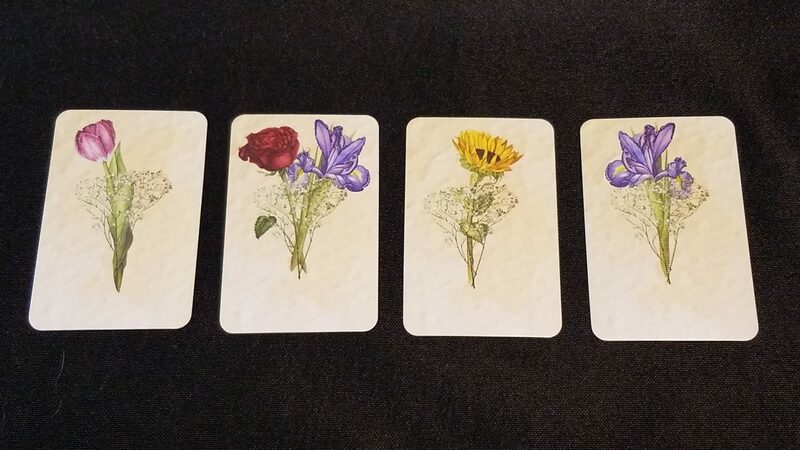 At the beginning of the game, players will draft themselves 3 Potpourri cards, each of which will effectively become variable player powers for that game – a new ability, a new way to score points, or even extra resources for use during the game! These simple changes add so much to the base game of The Little Flower Shop – in particular, this extra hint of strategy makes it easier to enjoy The Little Flower Shop as more than a family weight game. 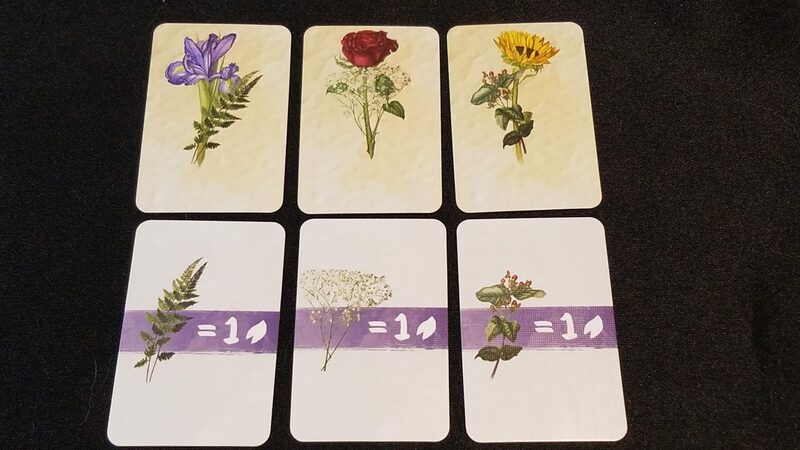 There’s nothing so complex here that it will make The Little Flower Shop unfriendly to new players, but the addition of the Potpourri pack will extend your enjoyment of this already fun base game, and this Kickstarter is the best way to pick up both the original game and this expansion!